An approach is reported for monitoring continuous-flow reactions by means of a low-field benchtop NMR spectrometer. 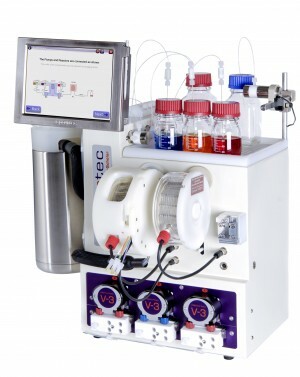 The spectrometer is interfaced with a mesofluidic reactor and used as a tool for optimising four organic transformations, namely an acid-catalysed esterification, a Knoevenagel condensation, a Diels–Alder reaction, and an alkylation. 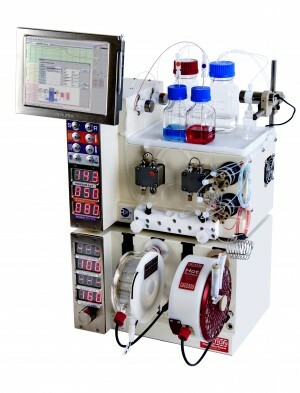 Reactions need to be performed either solvent-free or at relatively high concentration in order to monitor them effectively using the NMR spectrometer, but this allows for the leveraging of one of the key advantages of flow processing, namely process intensification.